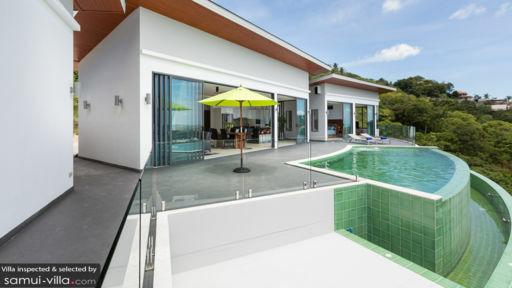 Villa Victoria is a premier holiday home found in the Chaweng area that is one of the most popular destinations in all of Samui. 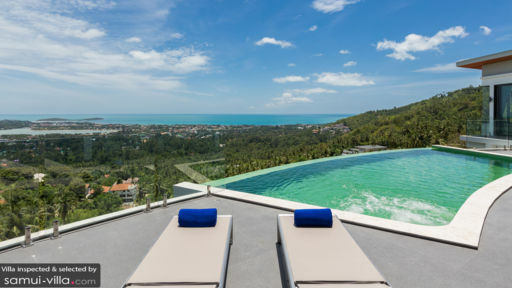 With three-way views of expansive oceans and mountains, the villa is nothing short of spectacular and awesome. It is modern, contemporary, and features elegant interiors with an architectural layout that allows amazing views of the panorama from each of its corners. The bedrooms have floor-to-ceiling glass doors leading to the deck where you have a Jacuzzi for six people. Head down to the beach and spend some time digging your toes in its pristine white sand or enjoying a cup of coffee at one of the many beachside cafes. The three, gorgeous bedrooms at Villa Victoria are amazing not just for their comfortable, bright blue, and leather-cushioned beds but also for the views they offer. Slide open the glass windows for unobstructed views of the mountains and the ocean. While the master bedroom offers a 270-degree view, another bedroom offers a pool and sea view. The third bedroom is a great vantage point for basking against a view of the mountain and sea. 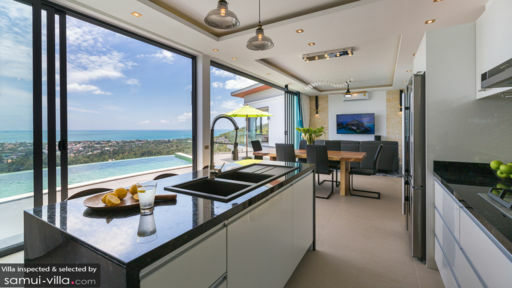 The bedrooms are modern, as keeping with the rest of the villa, and are fitted with flat-screen TVs, air-conditioning, abundant wardrobe space, ceiling fans, and ensuite bathrooms. The elegant bathrooms are designed with marble interiors, modern fixtures, and walk-in showers. While you spend time outdoors at Villa Victoria, you have front-row seats to the most mesmerising and arresting view you ever laid eyes on. For as far as you can see, there is the priceless turquoise ocean, vast skies, and luscious green mountains. Tropical flora grows on either side of the villa and you can laze about on the sun deck or lounge inside the Jacuzzi which lights with neon LED lights after dark. There are sunbeds for tanning and sunbathing as well. The glass doors of the living area slide open to a modern room that has been furnished with an element of luxury. The villa has been designed by a European designer which is reflected in its décor. The cascading chandelier, cove lighting, and traditional niche designed make the room as rich as you can expect. The comfortable modular sofa is perfect for times when you wish to kick back and relax. There is a satellite, Smart HDTV with surround sound and since the room is air-conditioned you can enjoy merciful quiet indoors. In the centre of the room that has massive glass doors that act like movie screens for the vista outside, lies the dining area. It has seating for up to six guests and a hand-crafted wooden table for a mix of modern and traditional. Enjoy deliciously-prepared meals with your loved ones and you can either make use of the fully-equipped, state of the art kitchen or request the staff to prepare something delicious for you. Villa Victoria is luxury personified with a personal concierge whose services are extended to all guests. Among other things, the concierge will help you with any immediate requirements and recommendations. If you’re travelling by car, the villa houses its own private garage. There is high-speed internet as well. Chaweng is a bustling part of Samui teeming with travellers roaming the streets, hanging out at cafes, and enjoying the delicious tropical sun on their backs. There are other beaches nearby such as Mae Nam that you can travel to. Chaweng is known for its nightlife and glistening white sand beaches.